I won this in a blog give away a while ago. Had been meaning to work on but other things took precedent. It fits in a plastic ring and the center is either a mirror or a dry erase message board. Has magnets so it can hang on a locker. Here is a link if you want to see them. I did not take a long time to do this but when done my brain is a little foggy. Looking for some opinions about whether should use color or traditional black/white and shading. This is not a voting thing. I will make the final decision, but just looking for feedback. Here is the basic design that I have so far. Thanks for visiting. As always your comments are welcome, encouraged, and appreciated. In this case also requested. Did not think that I would get to try another tile using Ahh so quickly. Probably just as well as things will be busy for the next few days and I probably will not have much time to do any tangling. This was a fun tile to do. I wanted to do some thing that was not a traditional use of Ahh. I wanted to somehow make Ahh the star. I decided to go bigger with the tangle and then do things inside. I called it Etude in Ahh as one definition of etude is a study. I know that it is generally used in relation to music but I figured it still fit. I also thought about doing the background all in black but decided to try something different. I aura-ed a pencil line around the different variations of Ahh and then used a blending stump. Had not done this much pencil shading before. Overall I am pleased with the results. Here is what I came up with. I hope you enjoy it. I included a few other tangles with Ahh. They are Betweed, Finery, & Tipple. Shading was done with a 2B pencil. Well, I said that I would post the final ZIA. This was more shading than I usually do. Of course this was probably bigger than what I usually do. Not going to say much about it. Will let you look at it and decide. I have my usual perspective. This was quite a task. I have to admit, it probably would have been better if I could have been really consistent and tangled a section a day. Was not able to do this. Here is what it looks like. I hope that your Christmas season was uplifting and fulfilling. I hope you enjoy this ZIA. Some of the shading does not show up as well in the picture as it does in person. Mostly a function of my older camera. Interesting prompt this week at Square One. This is a tangle that I almost see as an embellishment rather than a main tangle. Kind of like a role player on a basketball team; important but not the star. So this ended up being a pretty traditional use of Ahh. If I feel so inspired I may try another one. I am sure that there will be many unique ways that people will use Ahh. But, there is nothing wrong with using it for what it is. Just like there is nothing wrong with what someone does on a tile, even though it may not look like someone else's. Enjoy what you have created. Learning from others does not mean you have to compare yourself negatively to them or their work. Here is what I came up with. I hope you enjoy it. I was able to beat my deadline of getting this done the day after Christmas. It is just a little after midnight on the 25th and just got done listening to a choral presentation on TV that concluded with Handel's Hallelujah Chorus. Great piece. Had the opportunity a number of years ago to participate in a presentation of Messiah with a community choir. Was a lot of work, but enjoyed it. I digress though. Must be the way my brain functions late at night. Not 25 anymore. I used the work done in the first sentence. That is inaccurate. I completed putting all the tangles in. I still have to do the shading. Cannot stay up tonight doing that. Have 6 granddaughters coming later this morning and will need all my energy to deal with them. Will be fun. Here is what I have done, sans the shading. I hope you enjoy it. Where ever you are, I hope that you take some time to reflect on things. I know that everyone does not share my beliefs. That is a personal choice that we all have to make. It is like any other gift, we have to chose to accept it. For myself and my family, it is a time to reflect on the birth of our Savior. Not because of what the birth itself represents but what it set in motion and how it culminated 30 some years later. For us that is the greatest gift. How ever you celebrate this time of year, may you have an enjoyable time with family and friends and many blessing in the New Year. This is one of those tiles where if I had evaluated it before I was done doing all the tangles, I would have discarded the tile. Not that I would really do that, as I have discarded very few tiles. I started out with the circle in the middle as a string and did the rounds of Crescent Moon. The last tangle I did was Florz. This is a fairly simple tangle, but when I was even partially done with it, my whole perspective on the tile changed dramatically. It went from it is okay to I really like this. When this happens even questions about shading don't exist much. That is saying a lot for me as shading is an area I struggle with still after about 3 ½ years of tangling. 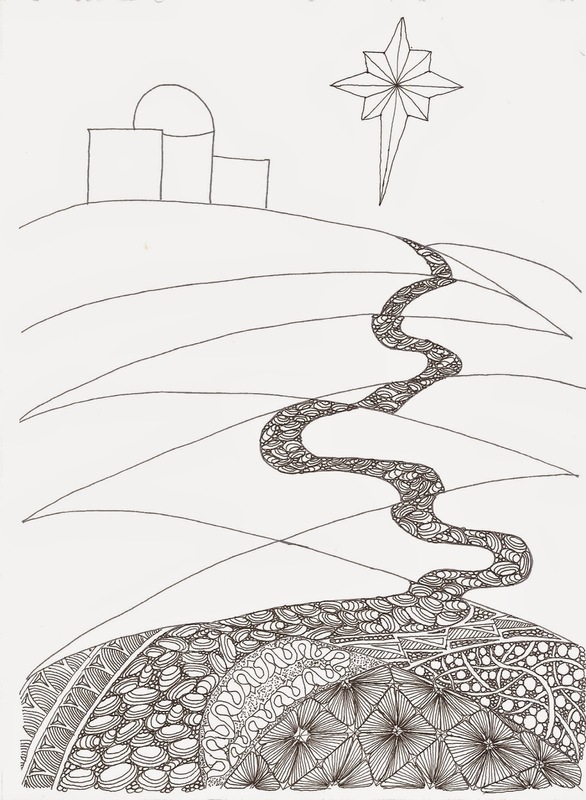 Cannot explain it, but it is one of the things that I like about Zentangle®. I cannot count the number times this has happened with tiles and Zendalas. Well enough rambling. You did not visit to hear my ramblings. Here is what I came up with. I hope you enjoy it. Shading was done with HB and 4B pencils. Am experimenting with my chop. May see a couple of different variations. If you have any thoughts, either way, about any of them, feel free to let me know. Some of what I have come up with lately reminds me too much of a bug. Quick update. I finished week 3 sections. Well almost. After I was looking at the pictures I took I realized that I had not filled in Bunzo. Oh well, you can see that in the final version. Am still behind. I still have 4 sections unfilled and should only have 2. Hopefully will get it done by Friday. If not will finish and post it later. Will probably post when I have completed some final shading as well. Not sure if I will add color or not. Here is what I have so far. I hope you enjoy it. Tangles used: Trivolution, Sand Swirl, Yah, Diva Dance, Zailz, Meringue, and Bunzo. As with the previous weeks, there were a number of tangles that I had not done before. Meringue, Zailz, and Yah definitely were challenges. will have to do some work in my journal to work on these a little. This will be a short post. Was a little undecided about posting as I have not completed all the sections for this week. Probably will not get all caught up until closer to Christmas so decided to post what I had done so far. This has been an interesting challenge. I have done better at staying up with my devotion than tangling in all the sections of this template. Maybe it has to do with the fact that the study is only 14 days and this is 25 days. Besides the time challenge, some of the suggested tangles have been difficult. Is surprised me a little as the strokes are not complicated, but have really had to concentrate. Not sure that I was successful in completing all the tangles. But as they say in Zentangle®, there are no mistakes, only unplanned opportunities. Here is what I have so far. I hope you enjoy it. Tangles used (so far): Sand Swirl, Trivolution, Yah, and Diva Dance. I put off doing anything for Square One when the prompt was posted on Friday. Was not really sure what I wanted to do. I have seen some really nice pieces of art posted on this prompt, which was Indy-rella. I was also busy with vending at a local Maker's Market. Things really did not come together until I saw The Diva's Challenge for this week. Sometimes when are not sure what to do, have to be patient. Not a thing that I am particularly good at. I had done monotangles of Indy-rella and combined it with a couple of tangles before. It is an easy one to combine with other tangles. Here is what I came up with. I had combined these tangles before and liked the result. The nice thing about it is that it is simple and it will never look the same. I hope you enjoy it. Have not looked at what has been posted on I am the Diva. Have a busy week ahead but hoping to have some time to look at what is posted. Since this is the last post of the year, may not get to it until next week. If you have not done so all ready would encourage you to also look at what others have posted. Also try it yourself. Thanks for visiting. As always, comments are welcome, encouraged and appreciated. Always looking for new things. This is not an original idea. I saw some that someone else had done. Not sure if these will end up as presents or they will be for sale at a show. Will have to wait and see. Only have this one done so far. These are Bistro mugs that I bought at Meijers. I washed them first to get rid of any residue left on them for manufacturing and packaging. This seemed to help. used Identi-Pens and then set it by heating it in the oven for about 30 minutes at 350º. The gray shading is Fabrico gray marker. It held up well. Other thing I did was wear gloves when I was doing this. Was a little concerned that would rub off, but more concerned the oils on my skin would interfere with the pen. I could not find a single pair of white cotton gloves so used a lightweight glove with rubber on the hands. This was great because I did not have to worry about the mug slipping. May try to use these gloves next year when I work on the glass ball ornaments. I did not want to do the whole mug. I did different style ZIAs on each side. Not sure exactly what I will do on the others, but like the idea of having one side organic and the other more traditional tangling. Here is what I came up with. I hope you enjoy it. Tangles used. In the top it is a cross between Mumsy and Arc Flower with a few Zingers. I kept it pretty simple. The lower one has Cadent, Bunzo, Bales, and 'Nzeppel. These are all favorite tangles of mine. If I have time, will post pictures of the others I finish later. This will be a short post. Had hoped to get this done sooner but have been busy with a number of things. I thought I would have been able to finish it last night but did not happen. This Advent journey is proving to be a challenge not just in terms of time, but also new tangles. I have not used very many of the tangles used so far. The one this week that I had used before, proved to be one of the more challenging. I am enjoying doing this though as it is different than most of the things that I usually do. Have only did minimal enhancements. Will do more later. Here is what I have done so far. I hope that you enjoy it. Tangles for this week are: Sails, Whirlee,A-fog, Jajazz, Snail, Hurray, and Crux. The template is from Living Well Resources. She has posted what she has done during the week. I have seen the suggested tangles for next week and I will continue to be challenged with new tangles. Not really the purpose of this, but it is happening. It has given me some meditative time during a very busy time. Will see how it ends, at least for this template. I know how what we are celebrating ends. Joins us if you can. If not, just follow along. Diva Challenge #197: "New Official Tangle - Arukas"
The Diva is back after a couple of weeks of guest posters. This week she chose to make the focus of the Challenge the new tangle released by Zentangle® headquarters. It was developed by Molly in appreciation of the many things that Sakura has done for, and with Zentangle. I had recently used Arukas in a prompt for Square One. I also taught it in one of my classes so I was familiar with it. I did want to do something different. I felt like I had gotten into a little bit of a rut in the type of tiles I did. I think I was successful and probably for people who have seen more of my work, would agree. I really wanted something that was more free flowing and just doing different things. I was not trying to fill the entire tile. I just wanted to let things flow where they wanted to. While I felt I was successful with doing something different there are somethings that I am not sure about. Over all I am pleased with the results, I want to keep working on things like this. Here is what I came up with. I hope you enjoy it. Have not looked at what others have done this week. Hoping to have some time during the rest of the week to get to see them. Would encourage you also to go to I am the Diva and look at what others have done. I would also encourage you to try it yourself. This week's prompt on Square One is Gneiss. Have used this tangle some, almost as an embellishment. Have not done much with it to highlight this tangle. Reminds me of some of the things that would construct with your compass and straight edge in geometry class. Tried to combine it with a different tangles and effects to finish off. Here is what I came up with. Hope you enjoy it. Thanks for visiting. As always, comments are encouraged, welcomed, and appreciated. Dianne, who is also my cousin, posted a template last week for an Advent Journey. She did one last year also. I contacted her as I was thinking that it would be a good thing for a class next year. She sent me the template and I decided to join in. I have to admit, I have not been consistent every day at completing a section, but I did get all the ones done for this week. It is not too late to join in. You can go to her post HERE to see and download the template. The first week has the suggested tangles for the first sections and we are now just beginning the second week. Even if you do not use all the suggested tangles it is a great way to focus on the meaning of the season. HERE is the link for week 2. Here is what I have completed so far. I hope you enjoy it. All of these were new tangles for me except Ing and wouldn't you know it, That was one that I had some difficulty with. I think that was as much the space that I chose as anything. It was hard to get much of a zigzag line. Was able to get this finished sooner than I thought. Have not used my gel pens for a while and that is what I used mostly in this tile. Is not quite as free flowing as I imagined in my mind but it turned out okay. Here is what I came up with. I hope you enjoy it. Nebel is a tangle from Sandy Steen Bartholemew's book Totally Tangled. I used Sakura Metallic gel pens and Stardust pens. They were both pink but was disappointed that the Stardust color does not show up well on the black tiles. It does show on white paper. Have not tried it on the Renaissance tiles, but thinking it will show up at least a little on those. I also used a white Prismacolor pencil for the highlighting and shading. Go to I am the Diva to see all the other great pieces of art. Diva Challenge #190: "Pink for Ardath"
This week's Diva Challenge is a tribute to the Diva's grandmother and all the other women that have had to deal with breast cancer. October is Breast Cancer Awareness Month. So the challenge is to use pink someway in your tile/ZIA. Was not exactly sure what to do, but the first thing that I thought of was the pink ribbon that is the emblem for breast cancer. Here is what I came up with. I hope you enjoy it. I do not remember the name of the tangle on the sides. I remember that it was a UMT Challenge a while ago. If anyone knows its name, let me know. I used a combination of materials on this on. Used both a black and pink Micron. For the highlighting and shading I used a Cornell pink and a Tombow pink pencil. I like the color of he Cornell, but the wood kept breaking on the pencil so I switched. The Tombow is a nice color, but it is light. The Cornell's do not blend will so just left them. I have not looked at any of the other things posted for this week's challenge. I hope I have some time to do so. I have another tile started that I hope I can finish before the weekend. If you have not, would strongly recommend that you visit I am the Diva to look at all the different submissions on this challenge. You may even want to try your hand at it if you have been reluctant to do so thus far. The prompt for this week is Aquafleur. This is relatively new tangle and many times has an aquatic nature to it. It however is one that has a lot of possible variations. I have not used it a lot but do like it. Mine tend to be a little more traditional. I have seen some really fantastic variations of this tangle. Maria Thomas has some in the newsletter on zentangle.com. Margaret Bremner has all ready posted a number of beautiful tiles on Square One on Facebook. You can view the pictures even if you are not a member. Here is what I came up with. I am pleased with it but as usual I can see areas that I would like to improve on . I hope you enjoy it. Looking forward to seeing other great posts and maybe having time to complete tiles for the Diva Challenge. Has been a busy few couple or weeks. This is the first Diva Challenge I have participated in for about 3 weeks. In between two classes, and a couple of days of the flu, I also did a presentation at the Art Educators Association of Indiana Convention on the Zentangle® and ZAP ( Zentangle Apprentice Program). I am barely getting this is under the wire. This is an interesting tangle. There is not a lot of difficult lines to draw, but not sure that I got the hang of it. Had a little difficulty deciding how to finish the tile. Here is what I came up with. I hope you enjoy it. Hopefully I will get a chance to look at what some others have done. If you have not all ready done so, would encourage you to go look at the great art that others have posted. click here to go to the Diva's blog. Still have lots to do before the end of the day and the start of the work week. Hoping to participate again regularly. The recent prompt on the Square One Facebook page is Fengle. I remember this one from training. It is fun to do, but sometime can get too complicated. Not sure if this one is finished or not. Not sure what else I might add but was thinking of different things for a background. Here is what I came up with. I hope you enjoy it. Going to be a short post. I finally got this done and wanted to post it. Since it is not a challenge, it is not late but the next prompt was released today. This one is on Pendrills. It is a tangle I have used before. It is a nice organic tangle. I kept it simple as I knew that I would not have a lot of time this week. Even with that I still did not get it done until today. Have been busy preparing things for a presentation and vending opportunity this weekend at the Art Educators Association of Indiana annual convention. I need to be up in about 7 hours. Still a couple of things to do before I can get to bed. Here is what I came with. Hope you enjoy it. What took the most time on this was the shading. Did not want to do a lot and chose to more of a shadow. Overall I was pleased with the result.